Housed in a cylindrical metal case painted green, with hinged lid, and shoulder strap affixed on opposite sides of the base. 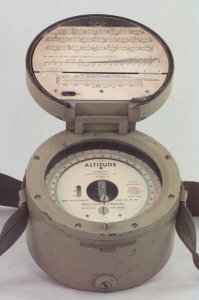 The base contains the altimeter, which is simply an aneroid barometer. This is sealed behind a glass face to prevent moisture entering. The lid has conversion scales "Air temperature and Relative humidity correction factors for Altitude", behind which clips in a hygrometer which is a Wet and Dry bulb thermometer style hygrometer. This was a U.S. Army field Altimeter which operated by the atmospheric pressure bending the elastic top of a partially evacuated drum, actuating a pointer. The hygrometer can be removed from the lid and spun in the air so that a measure can be made of air temperature and relativity humidity ( which affects the density of the air). After both barometer and hygrometer measurements are taken, the tables are used to evaluate the approximate altitude.